This guitar has tweaks and tradition in all the right places, and that's just our cup of T.
Sounds great on the bridge pickup. Well priced. Comfortable playing experience. When you think of LTD and ESP, pointy bodies and even pointier headstocks probably spring to mind. What you might not realise is that the Japanese company also has a long history of more traditional T-types, and in its current range, these include Ron Wood's signature model and Stephen Carpenter's six- and seven-string baritones. "The alder body is reassuringly weighty yet remarkably comfortable to play thanks to a Strat-like contour on the rear"
That brings us to the attractively priced TE-212. While it's hardly going to win any points in the originality department, this guitar possesses an unassuming charm that will win over any naysayers who recoil at the name on the headstock. The alder body is reassuringly weighty yet remarkably comfortable to play thanks to a Strat-like contour on the rear, which stops the guitar digging into your ribs. On the top, you get a pair of ESP LS-120 single-coil pickups, maple neck and fingerboard, plus a through- body six-saddle bridge. So, where does the UK bit come in, then? Well, LTD is so fond of our tiny isle that it's offered up a few TE-212s you can only buy over here. The key difference lies in the pickups: your common-or-garden TE-212 has a neck humbucker, while the UK model has a pair of single coils. We also get a choice of rosewood or maple fingerboards, plus the option of black or white scratchplates on the black finish, or a Pearl White model with ritzy pearloid scratchplate. We like our black-on-black review model just fine, though, especially with the classy creamy-white binding. The TE-212 playing experience impresses, too. Aside from a touch of buzz around the lower frets, the maple neck and fingerboard are smooth and satisfying to whip around, and combined with the resonant body, the overall feeling is one of robustness - this is a guitar that's built for the road. However, after strumming a few chords on the neck pickup, the TE-212 doesn't quite deliver the tonal goods as we hoped. 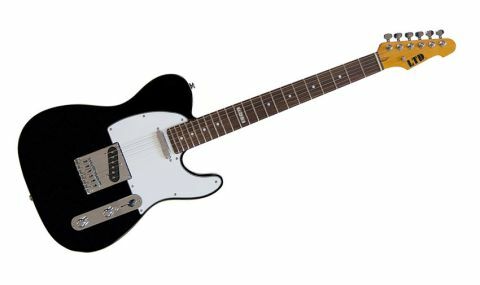 The neck pup should get a lot of play time on a guitar such as this, but compared with similarly priced Telecasters, ESP's single coil is a little dark for rhythm work, clean or dirty. Switching to the middle position is a different story, though, offering enough treble for biting country twang or funk rhythms. Engage the bridge single coil and you'll find another twist, thanks to a hefty increase in output. It's not harsh like some T-type bridge pickups; the LS-120's darker character pays off in the bridge position. It's ballsy and brash, and really thrives on overdrive, giving you a crunchy yet transparent tone that will please fans of spiky indie riffs. While we're grateful for the extra pickup and finish options LTD has offered, we can't help feeling that the neck humbucker-equipped TE-212 could be your better bet here - after all, that neck single coil was our only major complaint with the UK model. Nonetheless, this guitar has tweaks and tradition in all the right places, and that's just our cup of T.